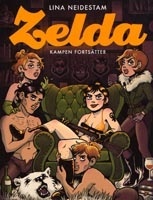 Zelda proved that a raging, alcoholic, self-destructive, self-hating, self-absorbed, irresponsible, manipulative, fat, hairy feminist could be an engaging and sympathetic character, and that a comic about such a character could be a lot of fun to read. With Zelda 2: The Struggle Continues, Lina Neidestam proves that a sequel can be made, and be even better. This second book starts where the last one ended and unlike the first, is built on a frame story. Zelda's long-suffering de-facto boyfriend (not really her boyfriend, since she feels alienated in the heteronormative pair role) has told her take her manipulative behavior and get lost. The book then chronicles Zelda's trip through art college and south-east Asia, where she struggles to find herself. I think it is rare and a mark of skill that an author provokes any kind of sympathy for a character. After all, they're imaginary. But Lina succeeds: When Zelda is brought along to a pool party only to find she was invited for the purpose of being the "ugly fat girl" that makes her friend look better - Lina, did you really have to? Like the first book, a lot of the humor in Zelda comes from the mismatch between her idealist view of the world and the way the world really is. It has been argued that Zelda isn't really a feminist comic because in many jokes, the "feminist" ends up on the "losing" side​. I would argue that any social movement will have a component where the idelogy meets the real world - and the result isn't always to the advantage of the movement. Not all beliefs survive the impact with reality; but one of the signs of a successful social movement is the ability to discard beliefs that turn out to be wrong, painful as that process may be. Zelda may not be an ivory tower-feminism comic, but it sure is real world-feminism. There isn't much more to say about Zelda 2 that I didn't already write in my review of the first book. Lina's skills have improved by leaps and bounds. The second book has all of the good sides of the first, and then some. But in a close reading I can set words to the undercurrent I've felt since I started reading Zelda when it was published in the newspaper City. Namely, that it is equally often about making fun of feminism. So this isn't at all a purely feminist comic.